Home Features Pattaya Mail Strikes Silver! 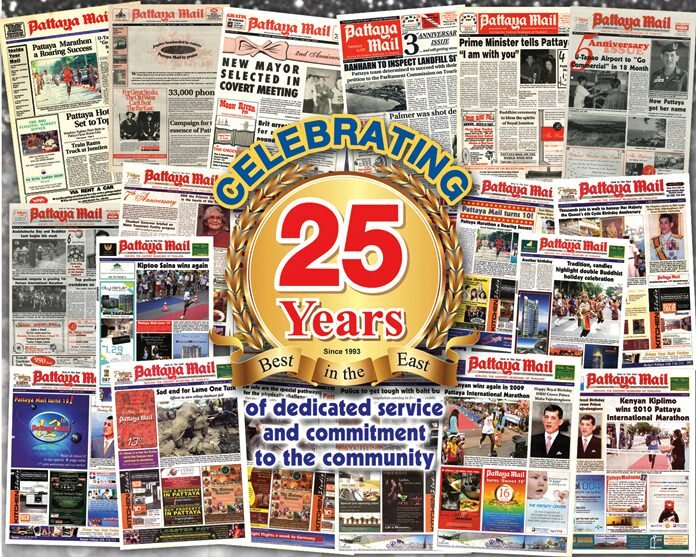 This edition marks the 25th anniversary of the first Pattaya Mail, Vol. I No. 1 that hit the newsstands on July 23, 1993. In today’s day and age, it’s remarkable for any business to last this long, but we did, and do not plan on stopping anytime soon. Spread throughout the following pages of this anniversary edition, we take a look back at the past 25 years. We hope you will enjoy reading it as much as we did researching and publishing it. It is with heartfelt thanks that we salute you the reader, you the advertiser, and you the contributor, for without you we wouldn’t have been able to last this long. We hope we may continue to live up to your expectations for many years to come. Throughout successive years of the Pattaya Mail, our special correspondent Peter Cummins, Thailand’s leading yachting correspondent, has chronicled the incomparable contributions His Majesty the late King Bhumibol Adulyadej and Her Majesty Queen Sirikit have made with love and dedication to their subjects in every corner of the Kingdom. Written not only with the highest level of academic veracity, Peter also was able to draw upon his own personal experiences with the Royal Family to chronicle their lives and put pen to paper for a number of special publications with Pattaya Mail.